Saliba el Katrib is a genius and unique oud player and an established singer. 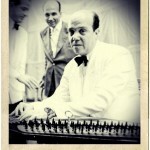 He was born in 1904 in a musical family as his father Mikhael Qatrib was a recognized percussionist. 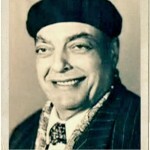 Saliba excelled in Egyptian Nahda (renaissance) singing, specifically Adwar, Mouwachahat, Qasaid, and mawawil. He was well versed in instrumental forms of Bashraf, Sama’yi and Longa which used to be the main sources of improvisation at the time. We have not located any ‘musical compositions’ by Saliba Qatrib much as we were not able to retrieve many of his other recordings. What we have today constitutes mostly of private recordings and live oud performances that were made over a long span through which we can identify the appearance of new attributes of his oud playing and singing at his late age. Such attributes are not specific to age, since he was able to maintain his virtuosity as a oud player and the charm of his voice and its flexibility until his late years. They also relate to the dominant changes in singing practices that took place during 1950’s and 1960’s in Egypt and Lebanon and made an impact even on the last decade of Um Kulthum’s career. Among the unique traits of Qatrib’s art and oud playing is his mastery of ‘down up picking’, which is in harmony with a solid rhythmic sense that he may have inherited from his father. This enabled him to create ornaments through filling all possible time scales with assertive strokes and quick improvised tune fragments that fascinatingly drift sometimes from the original tune before meeting it up again at the beginning of the rhythmic cycle in great clarity. This ‘down up picking’ ability is not derived from the Iraqi school established by el-Sharif Mouhieddine Haidar which Qatrib preceded chronologically and was not accordingly influenced by it. 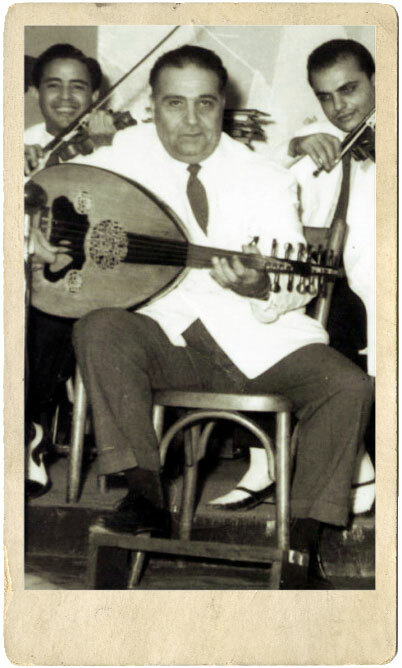 The researcher Haskell Kojman points out that Saliba Qatrib was the only non-Jewish oud player in Baghdad who accompanied Iraq’s diva Salima Basha Mourad for a noticeable period of time. Furthermore, Saliba is closer in the essence of his oud playing to the well-known player Yurgo Paganous with Balkan traces than the figurative music of El-Sharif Mouheiddine Haidar. As for tremolo that Qatrib sometimes used, it is totally different from el-Sharif ‘s style. Qatrib also diverges from the Egyptian Style inspite of his rhythmic strokes, which is a musical attribute established by the instrumentalists of the Nadha or Renaissance and developed by Qasabji and Sunbati. Qatrib seldom uses the base Rast string rhythmically, and his ornaments of composed melodies are improvisational ornaments seeking to construct new musical phrases with a higher tarab intensity resulting from the precise manipulation of melodic dimensions. The main attributes of Qatrib’s Oud playing are based upon the strength of his pick (plectrum), the vitality of its rhythmic strokes, the absence of hammering and the base reaction octave. He has a mastery of ‘down up picking’, improvising quick musical segments and a remarkable liberty in dealing with composed and inherited tune phrases while respecting rhythms with great discipline. This is apart from effective usage of the oud’s finger board, including entry into sharp high octaves, using the technique of ‘sliding’, introducing silence in several unexpected positions, and maneuvering between high and low notes. As for melodies, Qatrib’s offerings are not void of surprises, even if he contended himself with modal gratification to show the attributes of maqams, flavor of their dimensions and usually pleasing sequences, though sometimes he creates his own path or track. Qatrib is specialized in Egyptian singing particularly that there is no evidence of any recorded performances he made of Iraqi songs, since he lived in Baghdad, or even Lebanese or Syrian songs, may be with the exception of “Ana fi sekrein” which he masterfully sang. Yet this was not an obstacle for having clear uniqueness in his singing or oud playing along with evident “Shami” attributes, whether in his rhythmic approach in Egyptian dawrs or in some vocal ornamentation and improvisation of rural Lebanese singing, as in his recording of “Ana fi sekrein” during mid-1960s. Qatrib’s voice, particularly before his late age, is strong, manly, charming and flexible, rich in maqams and ornaments, and of changing texture and manner of production, following the style of Mashayekh. His singing depicts a unique mastery and sense of rhythm, which brings him closer for example to Shiekh Zkariya Ahmad’s school. In his late recordings, Qatrib substituted that vocal strength with his experienced rhythmic sense and mastery of mood that intrigues irrevocable tarab.